The Irish Horse Traders were a well known, if irregular, part of the historical businesses of Ray City and other Georgia communities. “The history of the Irish Horse Traders in this country dates back more than a century, when the first family landed in America and opened a livery stable in Washington, D.C. Other families came from the clans of Rileys, McNamaras, Carrolls, Sherlocks, Garmans, Costellos, Dartyrs, and O’Haras. When trade slackened, the clans organized themselves as travelling horse traders, going about in covered wagons with their animals on leads. These Irish Horse Traders have preserved their entity. Marriage is confined to the limits of the eight original families, and only rarely has this tradition been violated. The families in America now total approximately 10,000 members, some of whom are very wealthy. The traders travel in high-powered motor cars, carrying tents and household goods in trailers and their animals in trucks. In Atlanta the clans bought large tracts and settled for a short time, but they soon started out again, retaining their land titles in the Atlanta territory. Several are now in business at the Atlanta stockyards. Because of the various families are separated and seldom communicate with one another, many members attend an annual reunion in Atlanta on April 28 have marriage ceremonies performed, and bury their dead. The bodies are shipped to the city and kept in vaults until the date of the reunion. Funeral services are held at the church of the immaculate conception. The horse traders began the custom of burying their dead in Atlanta, where Roman Catholic priests were available, in 1881 when John McNamara died while in Atlanta and was buried at Oakland cemetery. 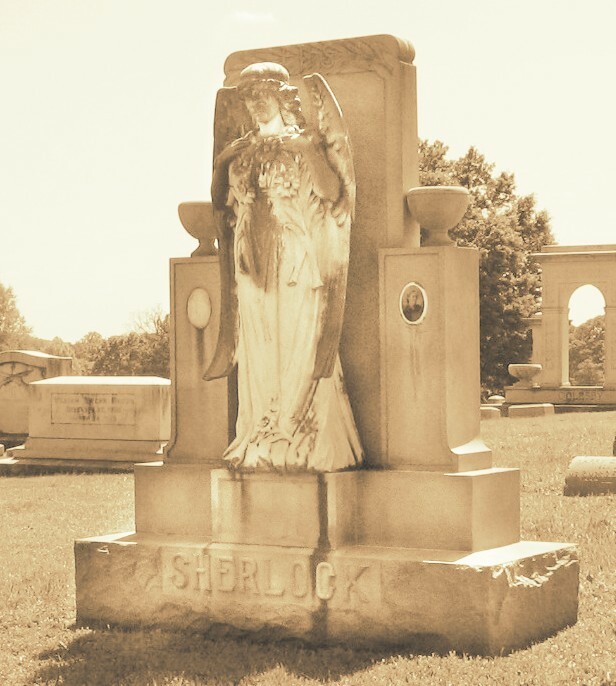 When no more interments could be made at Oakland Cemetery they purchased lots in Westview. John Sherlock was with a band of Irish Horse Traders that camped at Ray City, GA in the fall of 1919. There at Ray City, on November 12, 1919, John Sherlock died. According to Garrett’s Necrosis records, John Sherlock’s parents were born in Ireland. He was the husband of Minnie Sherlock, and his home address was the Irish Horse Traders’ camp at the corner of Bellwood Avenue and Ashby Street, Atlanta, GA.
John Sherlock’s obituary was published in the Atlanta Constitution, and as was the custom of the Irish Horse Traders, his body was shipped to Atlanta to be held for the Irish Horse Traders’ annual funeral celebration . Was Member of Band of Irish Horse Traders. 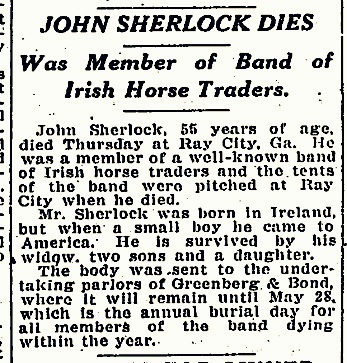 John Sherlock, 55 years of age, died Thursday at Ray City, Ga., He was a member of a well-known band of Irish horse traders and the tents of the band were pitched at Ray City when he died. Mr. Sherlock was born in Ireland, but when a small boy he came to America. He is survived by his widow, two sons and a daughter. The body was sent to the undertaking parlors of Greenberg & Bond, where it will remain until May 28, which is the annual burial day for all members of the band dying within the year. 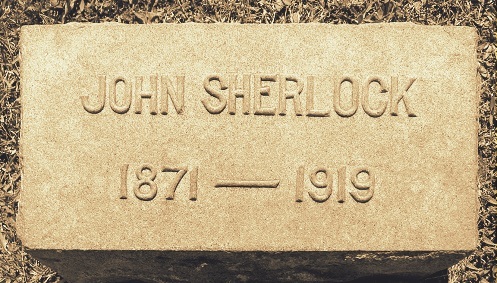 Grave of John Sherlock and Minnie Sherlock, Westview Cemetery, Atlanta, Fulton County, GA.